The Eagles were an American rock band formed in Los Angeles in 1971. With five number-one singles, six Grammy Awards, five American Music Awards, and six number one albums, The Eagles are one of the world’s best-selling bands of all time, having sold more than 150 million records. The Eagles Greatest Hits album was the best selling album of the 20th century. Dark Desert Eagles are formed. Touched by the passing of Eagles co-founder Glenn Frey, Pat Badger (an original member of the multi-platinum rock act Extreme) set out to form the Dark Desert Eagles band. Badger is an enormous fan of The Eagles’ musicianship, vocal harmonies and timeless repertoire. Having toured the world with Extreme, and having been a part of a group that sold over 10 million records featuring Top 10 hits like Hole Hearted and the Number 1 Grammynominated smash hit More Than Words, Pat Badger had a vision for the types of musicians he would need to create the ultimate tribute to The Eagles. Having also attended Berklee College of Music, Badger set out to find the best of the best in the music community. He enlisted fellow Extreme bandmember Kevin Figueiredo, multi-instrumentalist Chris Lester, soaring guitar hero Eric Clemenzi a Berklee graduate,and Tom Appleman, a Berklee College of Music Professor. Each of the musicians in the Dark Desert Eagles painstakingly re-creates the amazing soaring harmonies and music of The Eagles! “But just pulling off the music is just part of it.” Badger says, “We really want to bring the audience back in time to the 70s! The image is almost as important as the music and we have really paid attention to detail on the wardrobe, the hairstyles, the guitars… everything that made the Eagles so cool!” He goes on to say, “We’re not just pretending to be the Eagles, we are the Dark Desert Eagles who are the self proclaimed World’s Greatest Eagles Tribute band from 1977! 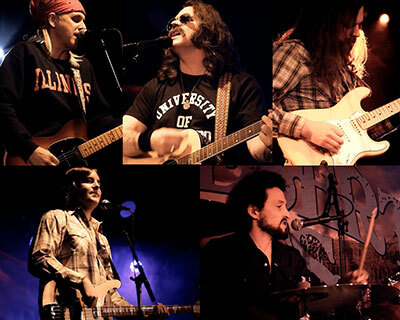 For fans of The Eagles who long for the LIVE re-creation of some of the greatest hits of a generation, the Dark Desert Eagles are the Ultimate Tribute to The Eagles. Songs such as “Take It Easy”, “Witchy Woman”, “Peaceful Easy Feeling”. 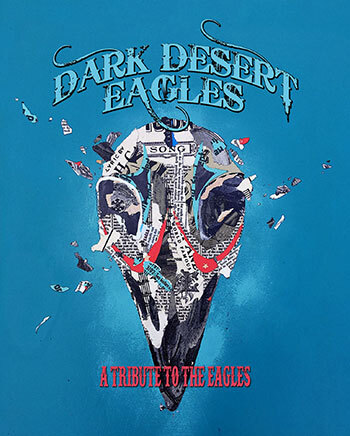 “Desperado”, “Tequila Sunrise”, “Already Gone”, “One of These Nights”, “Lyin’ Eyes”, “Take It to the Limit”, “Hotel California”, and several gems from the Eagles’ members solo careers are masterfully re-created during a live show of the Dark Desert Eagles. Buckle up and get ready to enjoy a stunning musical tribute toAmerica’s Greatest Rock Band—The Eagles.